Purified antibody is conjugated with Fluorescein isothiocyanate (FITC) under optimum conditions. The reagent is free of unconjugated FITC. This product was changed from ascites to tissue culture supernatant. Please note that the dilutions may need to be adjusted accordingly. If you have any questions, please do not hesitate to contact our scientific support team. Our Abpromise guarantee covers the use of ab91493 in the following tested applications. Flow Cyt: Use at a concentration of 2 µg/ml. Defects in CD247 are the cause of immunodeficiency due to defect in CD3-zeta (CD3ZID) [MIM:610163]. An immunological deficiency characterized by T-cells impaired immune response to alloantigens, tetanus toxoid and mitogens. Belongs to the CD3Z/FCER1G family. The ITAM domains mediate interaction with SHB. Phosphorylated on Tyr residues after T-cell receptor triggering. ab91493 has not yet been referenced specifically in any publications. Publishing research using ab91493? Please let us know so that we can cite the reference in this datasheet. 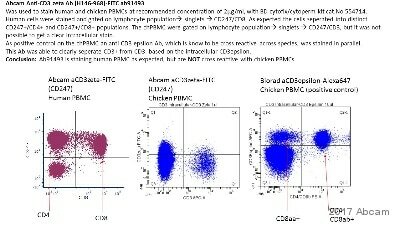 Hi there, I am looking for the mouse anti-CD3 zeta antibody [G3] (FITC) from Abcam. It seems that this product has been discontinued. Do you still have some in the stock? Or do you have better ones to recommend? What I need is an antibody against both the phosphorylated and unphosphorylated forms of CD3zeta. We do not have any more of ab11505 in stock. Are you able to use the PE-conjugated version of the same clone, ab33395, or the unconjugated version, ab11218? 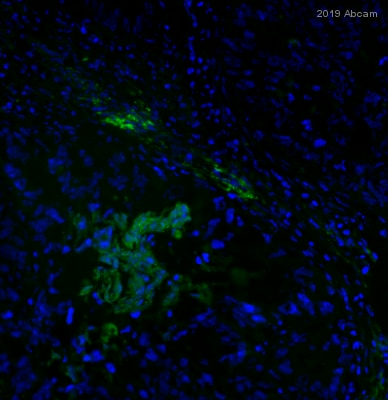 Alternatively, we have a FITC-conjugated hamster monoclonal antibody that is raised against mouse CD3 zeta that will recognize total CD3 zeta, phosphorylated and non-phosphorylated: ab91493. These have all been tested in flow cytometry (and for the unconjugated antibody, several other applications). The samples are of Human origin. Unfortunately, I am sorry to confirm that I have checked the CD3 zeta antibodies that have been tested in flow cytometry and human samples. These have epitopes in the cytoplasmic domain, and so would require permeabilization, so intracellular as well as membrane CD3 zeta would be detected. I am sorry we do not have a suitable product to suggest on this occasion, I hope this information is nevertheless helpful to you. Please do not hesitate to contact me if you have any further questions. I'm looking for an antibody against cytoplasmic or intracellular form of CD3 Zeta. So far I was only able to find antibodies against it's membrane form, could you assist with finding the appropriate antibody? I have done some literature searching and am not able to find any information to indicate that the membrane and cytoplasmic forms of CD3 Zeta are different, apart from the localization. Therefore, I would suggest the CD3 zeta antibodies we have will detect both. I am sorry it appears it would not be possible to distinguish between the two unless you observe the cellular localization of the staining in IHC-P, IHC-Fr or ICC-IF. If you do have any further information on any differences between the CD3 zeta protein found at these two cellular localizations, please do not hesitate to let me know. I will be happy to review the immunogens for the antibodies if there are any more details. Do you think the secondary antibodies might react with ab91493? It is a good idea to allow for all three antibodies to be tested on one run, given ab91493 presence what would be a right flurophores choice for the secondary antibodies against ab78366, ab86141? ab97077 is a goat anti-rabbit secondary so it is unlikely to react with ab91493 (host species hamster). However, ab97037 is goat anti-mouse secondary antibody and it may cross-react with hamster IgG since mouse and hamster are relatively close species taxonomically. Therefore, it may be worth checking any potential cross-reactivity in a separate experiment ie. ab91493 with ab97037. One of our customers wishes to perform a Flow Cytometry procedure in which he will use antibodies ab97037,ab97077 as secondaries. Above secondaries will be used with a Rabbit and Mouse primary antibodies. Another primary to be used is ab91493 - Would the anti Rabbit and anti Mouse secondaries cross react with aPrimary antibody made in Hamster? Could you please confirm if the customer would like to perform double or triple staining? I am a bit confused why the two selected secondary antibodies ie ab97037 and ab97077 (Cy5 ®) have the same fluorophore? Would it be better to select three secondary antibodies with three different conjugates? Could you please explain?